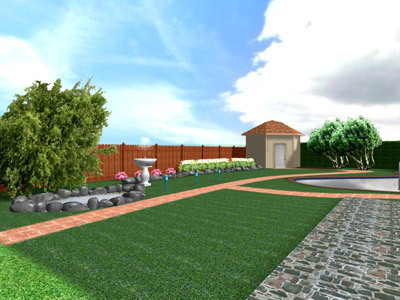 This free landscape design plan is purposed for medium sized backyards, with size of 80' x 80' and the possibility to construct a swimming pool without any obstacles in the ground like rocks, pipes or wires. This beautiful garden plan is tended to be used for medium sized back yards and will have better layout than any small sized plan. To prepare the ground you must use appropriate fertilizers and grass seeds as per our other articles. 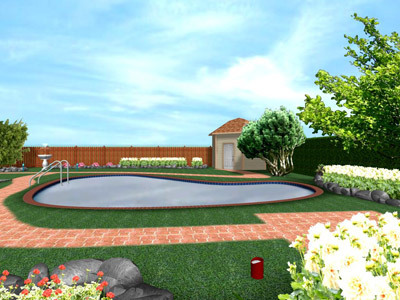 The size of the swimming pool in this free garden design is planned to be medium. We want to concentrate our attention on the small stairs and the beautiful oval shape. 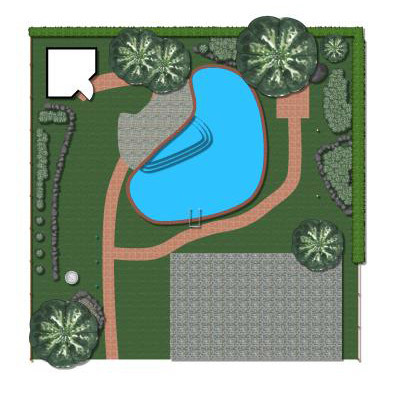 Many of the different plants used in this garden plan are small flowers or high trees so they can expose the stylish rock gardens and miniature pond in the beggining of the decorative path. 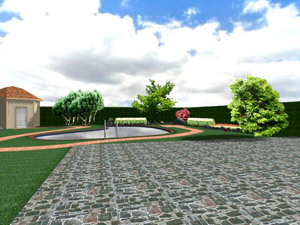 Some of the flowers and the shrubs must be planted before the real development so they can reach the necessary height and age for a better view.